ITV’s award-winning series Victoria pulled in thousands of viewers and, with plans for a third series under way, it seems the public can’t get enough of Queen Victoria. While the famous monarch is perhaps best associated with Balmoral Castle in Royal Deeside, she also had strong connections to Blair Castle in Highland Perthshire and enjoyed a close friendship with the Duchess of Atholl. Both of these are explored in a fascinating new exhibition titled Victoria at Blair Castle. Over the next few weeks, visitors to the castle in the village of Blair Atholl near Pitlochry will be treated to a memorable experience as the exhibition not only looks back at the Queen’s close connection with Atholl Estates and Blair Castle but also includes some of the stunning costumes from the period drama – the castle was the setting for the seventh episode in the second series of the programme. The castle’s archivist has curated an educational and engaging showcase of images and artefacts relating to the time Queen Victoria and Prince Albert visited the region, alongside key facts and anecdotes which illustrate the role they played in the history of Atholl Estates. Visitors can learn why the Atholl Highlanders are known as the only private army in Europe; what lasting tribute Princess Victoria planted in the estate; view the private letters exchanged between Duchess Anne and Queen Victoria; and learn about the special gift the Duke and Duchess of Atholl gave to Queen Victoria. First visiting Scotland in 1842, Queen Victoria and Prince Albert quickly fell in love with the country and subsequently chose to return in 1844, when they stayed at Blair Castle for three weeks. Julia Sim, from Blair Castle, said: “Not only did Queen Victoria and Prince Albert develop a close relationship with the Duke and Duchess of Atholl, but they were also advocates of Blair Castle and enjoyed their initial visit to the region so much that they chose to return for what in those days was a long stay. “The combination of old and personal artefacts belonging to Queen Victoria, alongside the replica costumes from the ITV period drama, all help bring the stories from the past back to life. They also paint a picture of the relationships and happy times enjoyed by the royal couple at Blair Castle. 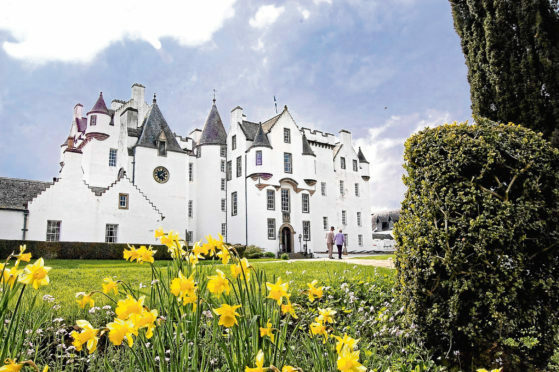 Situated in the heart of Atholl Estates, the castle was built in 1269 and today is the home to the 12th Duke of Atholl. Set against the magnificent landscape of 145,000-acres, the estate offers beautifully scenic vistas of rolling farmland and wild open hills across Perthshire. The Queen Victoria Exhibition runs until Sunday, June 10. Access to the exhibition is included in the entrance fee of £12 per adult, with annual season passes for access to Blair Castle and the grounds available at a cost of £20 per adult. Children’s and family tickets are also available. Further up-and-coming events at the castle include The Atholl Highlander Weekend on May 26-27 when the duke carries out an annual inspection of his army, the only 90-strong private army remaining in Europe, and the annual Blair Castle Horse Trials which take place between August 23-26. Will Harry and Meghan choose St George’s Chapel for baby’s royal christening?